For more information on choosing the right Norcold, Dometic, or Advent RV refrigerator for your RV, see our RV Refrigerator Buyer’s Guide, which explains some of the differences in using a gas, AC, or DC powered fridge and other useful information. If you’re ready to browse or purchase your new RV refrigerator by Norcold, Dometic, or Advent, check out our RV refrigerator page. 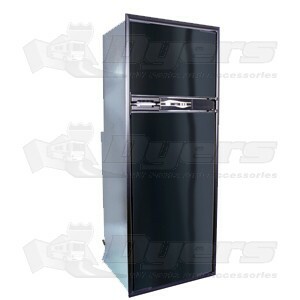 We also have a number of parts and accessories for your RV refrigerator. One of the best parts of RV camping is gathering with new found friends and family to eat freshly cooked food after a day of activity. Did Dad and Junior catch a lot of fish, a few meals worth, you need a place to keep that food fresh. If you don’t have a refrigerator you are limited to coolers and lots of ice. You need to continually go to the store to get more ice, not to mention dealing with soggy sandwiches or melted chocolate. It is very inefficient and inconvenient. Refrigerators offer the safety and convenience that an ice chest does not. With a refrigerator you can safely store all of your food with no concerns about food going bad, melting, safe food temperatures or ice runs. A day of active adventures and exploration leads to a hungry bunch of people while you are out hiking. With a portable ice maker you can pack the cooler without having to go to the store just to get ice. 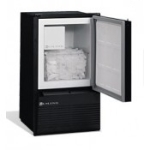 The Dometic stainless compact portable ice maker is able to make 26 lbs. of ice every 24 hours! Always have a large quantity of ice ready for whenever you want to pack a cooler and go on a daytime adventure away from your RV. If you are an ice lover without an ice maker in your RV refrigerator you can make ice in your own home, this device is perfect for you! There are also a lot of parts that work together to keep your refrigerator working properly. 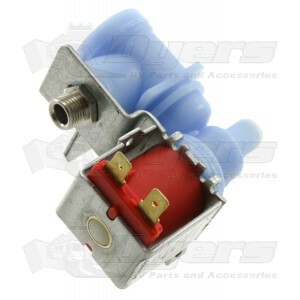 At Dyers we carry those replacement parts like door handles, thermostats, power modules, shelves, and heating elements. Those parts that fit your refrigerator because the last thing you need is to have to replace a perfectly good refrigerator because you cannot find compatible parts to fix it. At Dyers we carry refrigerators and the parts to repair them from name brand companies like Advent, Dometic, Atwood, and Norcold. 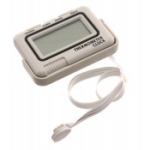 These companies are known for designing appliances and parts for RVers. 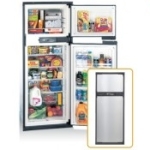 With a variety of sizes, colors and ice maker options, whatever your food storage needs Dyersonline.com has the right option for you.